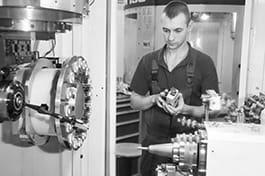 CNC operators operate computer-controlled machines or robots to perform machine functions on metal or plastic workpieces. Determine specifications (material, machine operation, etc. ), tool and equipment requirements and procedure sequences from blueprints, instructions and machine knowledge. Select tools and materials necessary for the job. Set up machine controls by turning the planned machining operations into a set of instructions. Test the machine operation by a trial run or using computer simulations. Control machines during operation, e.g. by listening and observing, in order to detect problems or irregularities. Confer with supervisor or programmer to resolve machine malfunctions and production problems. Adjust machines in case of malfunctioning, problems or irregularities. Mount, install, align and secure tools, attachments, fixtures and workpieces on machines, e.g. using hand tools and precision measuring instruments. Maintain machines and remove and replace broken or worn machine parts using hand tools.